Summary: Love isn’t on the face; it is deep in the skin. The protagonists, Mridula and Sanjay are brought together by fate but they decide to call it ‘love’. Sailing through humble beginnings, when Sanjay decides to work in a government hospital, Mridula becomes a solid rock to not only support the house but also Sanjay. What forms the rest of the story is their journey on the road to success, their love in the meanwhile and the lube called trust. Mridula has been portrayed as a very strong character, who knows the good and the bad. A very touching, emotionally liberating read, which leaves you utterly satisfied and happy in the end. What really clicked? The author! She’s my favorite. My take: House of Cards by Sudha Murty revolves around two strong characters – Mridula and Sanjay. Spread across 29 chapters, the story, narrated by the author, unfolds step by step, taking you on an emotional journey of love, trust, infidelity and self-respect. Mridula is a teacher in Aldhahalli, a very small village in Karnataka, while Sanjay is practicing in KEM hospital in Bombay. They are brought together by fate, first during a wedding and, second, in Bombay during one of her school trips. Mridula happily accepts Sanjay in her life despite his deformity by birth. She is touched by his clean feelings and a clear soul. Mridula gets shocked meeting her mother-in-law, Rantnamma, who is extremely stringent and business-minded. Rantnamma runs her small shop close to a temple and prioritizes it over her recently married daughter-in-law. While being just the way she is, she teaches Mridula an important life lesson, i.e., to save money. Her sister-in-law, Lakshmi is equally cunning and money-minded. Mridula, being the strong character that she is, not only adjusts to a new town after marriage, but also wins a battle over language and culture differences. She supports Sanjay all through his post-graduation course by becoming the sole breadwinner for the family. Sanjay is badly dejected when he's not able to evade a transfer he’s been given as a result of some office politics. That’s when he decides to open his private nursing home with the help of a friend, Alex. Things change from here and the-once-middle-class family, now, starts pacing towards a much prosperous life. What changes during this journey is the relationship between Mridula and Sanjay and of them with their son, Sishir. Mridula doesn’t find enough words to console Anita, wife of Alex, who ends up finding condoms in Alex’s drawer. She suspects him of infidelity. Walking on the same lines, Mridula comes across serious revelations of his husband not trusting her with the money decisions and taking severe major decisions in favor of his sister, Lakshmi, without taking her in confidence. Mridula is left dejected and lost in life. She feels her husband had forgotten how they had begun the journey together, leaving her stranded in the middle, claiming it an infidelity of trust. 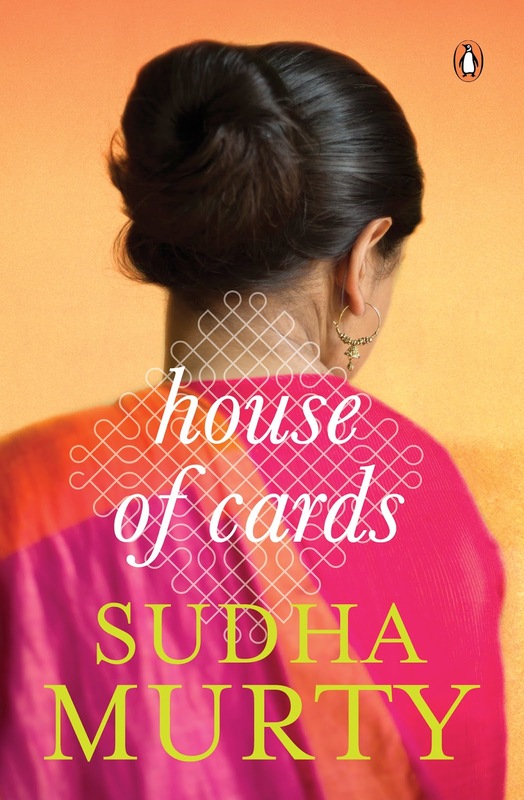 Final word: There are a certain books which keep bringing you back to basics, putting together the definition of simplicity and clearing up life for you - House of Cards is, indeed, one of them. It is all the knowledge, the wisdom and the experience of the author which talks through her words. The protagonists, Mridula and Dr Sanjay, are reluctant to fall in love but let destiny have her say; together, they witness the ups and downs of their lives, with Mridula being a solid rock of the house. They see it all, the bad's and, lately, the great's but what really changes the contours of the story is their reaction towards it. What an amazing read, with the same guiding principle (also mentioned thrice throughout the book) ruling Mridula's life. Mridula was not like everybody, she was different. She had enormous enthusiasm for life and unlimited energy. She wanted to spend every minute of the day fruitfully. It seemed the sun rose for her and the rainbow colours were meant only for her. Every day was to be lived to its fullest and every beautiful minute to be enjoyed. Appears to be a good reading. Thanks for sharing your take. Nice review. Like to get my hand on the book.